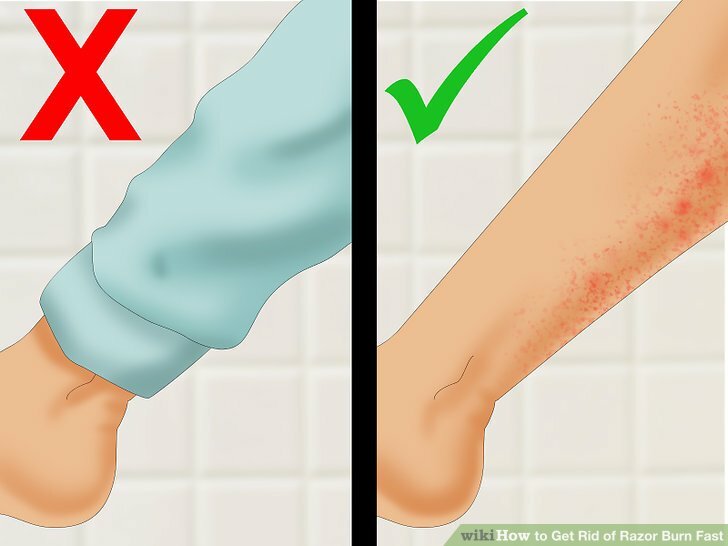 Razor burn is a painful problem that can occur after shaving. The irritation, itchiness, and inflammation can last up to a week. However, there are ways of accelerating the recovery process. Treating the problem with natural or over-the-counter remedies can cut healing time to a just a few days. Apply a cold compress immediately after you shave or notice the burn. Wrap some ice cubes in a small towel or run a washcloth under cold water and squeeze it until it is damp but not dripping wet. Apply to the razor-burned area for five to ten minutes several times per day until the razor burn has subsided. 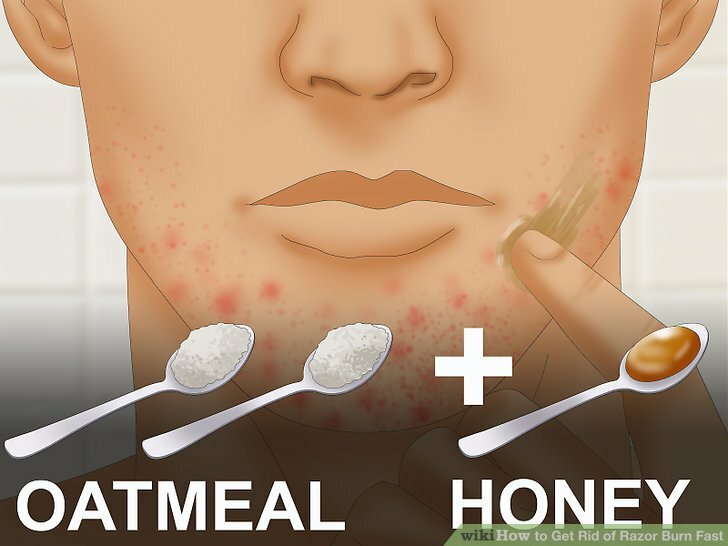 Apply an oatmeal mixture to your skin. Oatmeal naturally soothes and exfoliates the skin. Mix two tablespoons of ground oatmeal with one tablespoon of honey. Apply the mixture to razor-burned skin and keep it there for thirty minutes. If you find the honey-oatmeal mix is too thick and difficult to apply in a smooth, even layer, you could add one teaspoon of water to it. Applying the mixture just after shaving could maximize its efficacy. Cover the razor burn with honey and apple cider vinegar. Honey has many natural antibacterial agents and moisturizing properties. 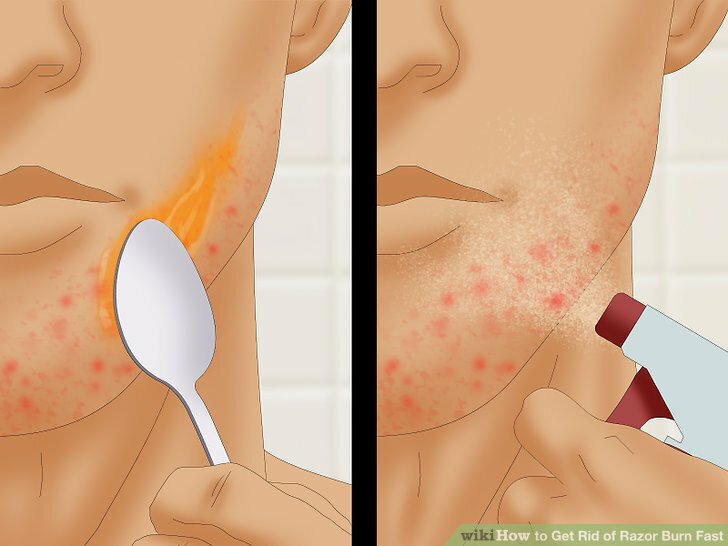 Using a small spoon or spatula, cover the razor burn with a thin layer of honey. Let the honey sit for about five minutes. Wash the area off under cold water and dry your skin with a small rag or towel. Next, splash a small amount of apple cider vinegar over the affected area. For a more even application, you could fill a small spray bottle with apple cider vinegar and squirt the affected area once or twice. After applying the vinegar, allow it to air-dry. The anti-inflammatory qualities of apple cider vinegar will cool the skin and relieve your razor burn. Apply black tea bags to the razor burn. Go to your local supermarket and obtain some black tea bags. They are typically sold in small boxes of ten to twenty. Any brand will do, but make sure to obtain only black tea. Dip the tea bag in water to moisten it. Rub it gently over the razor burn. The tannic acid in the black tea can reduce redness and inflammation caused by razor burn. Repeat two to three times each day, or as needed. Do not rub the bag too vigorously over the razor-burned area, as the tea bag is very thin and easily torn. Mix a baking soda treatment. Add one tablespoon of baking soda to one cup of water. Stir until you get a smooth paste. If your solution remains liquidy, add more baking soda. Dip a cotton ball in the solution and spread it across the razor burn. Allow it to sit for about five minutes. Remove the cotton ball and wash the area off with cold water. Repeat two to three times each day, or as needed. Apply aloe vera to your razor burn. Aloe vera is a plant whose leaves contain a gel with moisturizing properties. Cut an aloe vera leaf along its edge to squeeze out the gel within. If you have trouble squeezing the gel out, use the knife or your fingers to scrape it out from within the leaf. 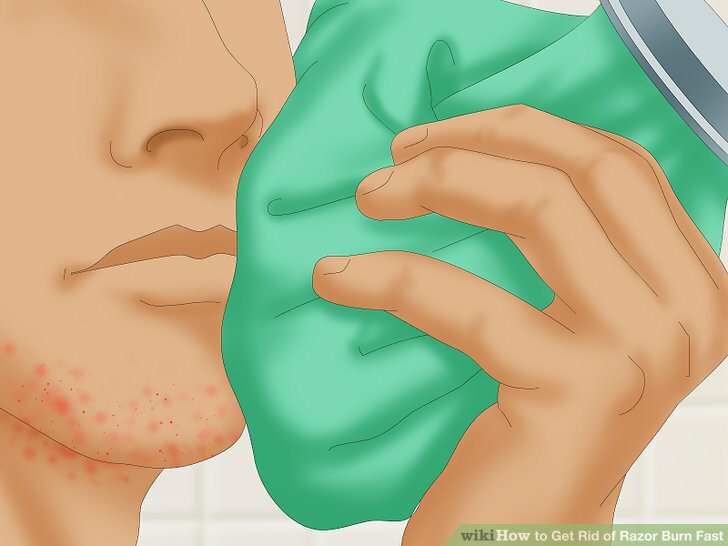 Rub the gel on your razor burn in a circular motion with the tips of your fingers. Continue massaging it into your skin for about two minutes. Let it sit on your skin until its soothing properties subside. Then, rinse the affected skin with cold water. Repeat this application two to four times each day, or as needed. If you don’t have an aloe vera plant or can’t easily obtain aloe vera leaves, you can use the same technique with store-bought aloe vera gel. 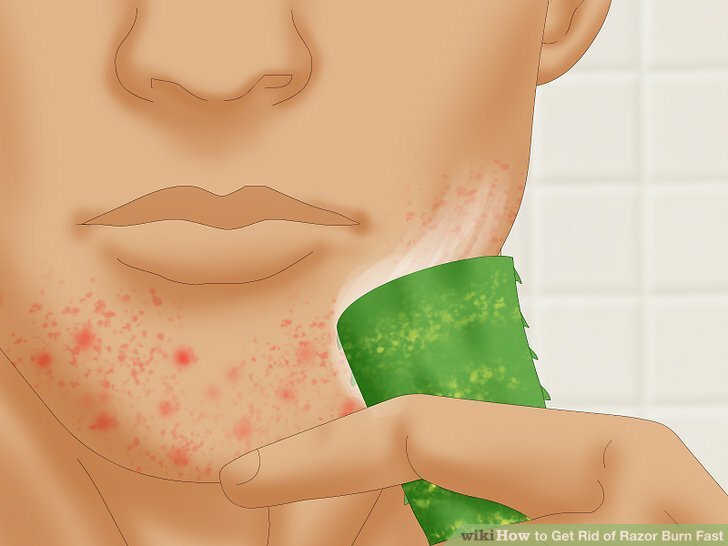 Apply cucumber and yogurt to your razor burn. Cucumber contains many hydrating and anti-inflammatory properties, and yogurt contains lactic acid which exfoliates the skin. Together, they can help you get rid of your razor burn quickly. Blend half a cucumber with one to two tablespoons of plain yogurt in a blender or food processor. Scoop some of this cucumber-yogurt mix out and apply to the razor-burned area in a thin layer with a spoon or spatula. After twenty minutes, wash the mixture off with lukewarm water. 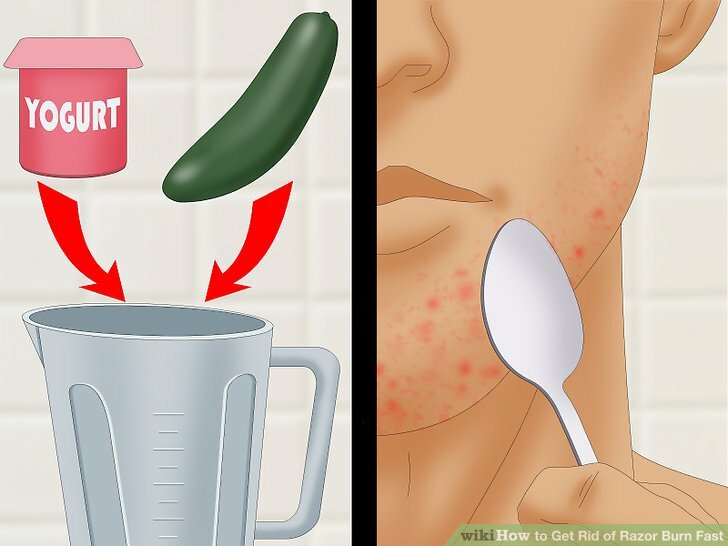 If you’re applying the mix to a larger area of razor burn, you should add two tablespoons of yogurt rather than one, and use a whole cucumber, rather than just a half. If you don’t have any yogurt on hand, raw cucumber slices can also be applied directly to the razor burn for fast, soothing relief. Cut some thin cucumber slices and place them in the fridge for about thirty minutes. Apply them for twenty minutes. Use witch hazel on your razor burn. Witch hazel is an extract made from the bark and leaves of a small shrub. Witch hazel contains many astringents that help heal and sooth your razor burn. 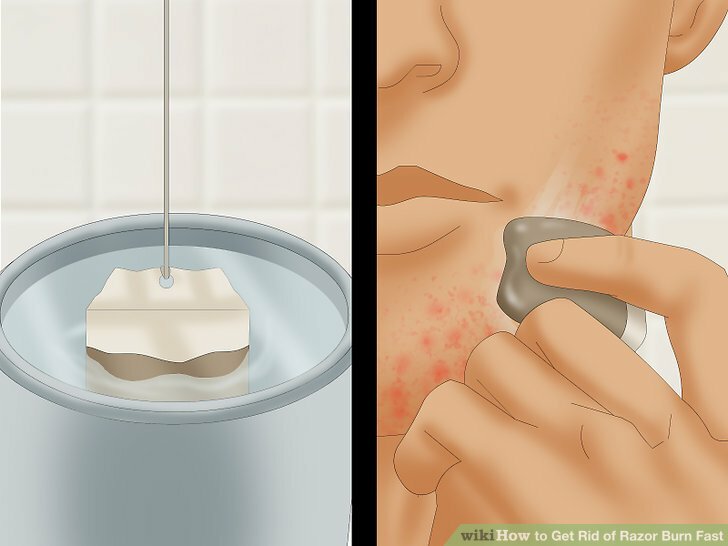 Dip a cotton ball in a small volume of witch hazel and rub it on the razor-burned area. You could also choose to fill a spray bottle with witch hazel and spray two or three squirts of it on the razor burn. Whatever method you choose, apply the witch hazel two or three times per day, or as needed. Apply essential oils to the razor burn. 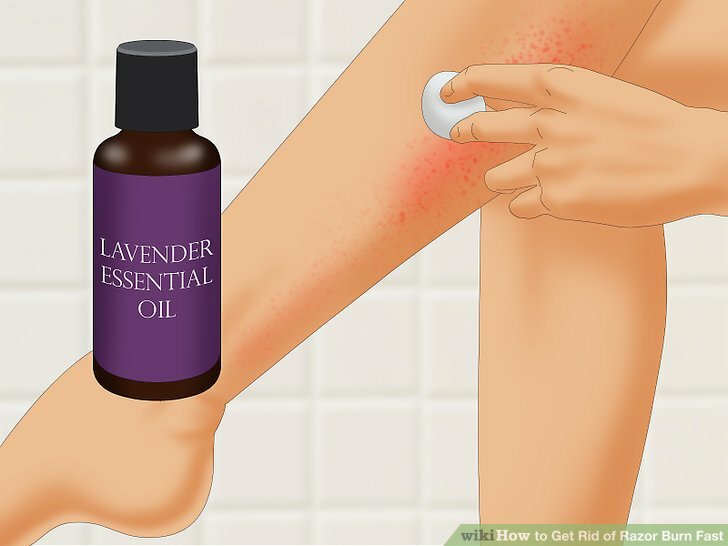 There are many essential oils that can help you get rid of your razor burn fast. Lavender, chamomile, and calendula essential oils are useful for soothing razor burn. Mix six to eight drops of any oil of your choice with a quarter cup of water. Soak a cotton ball in the oil-water mixture. 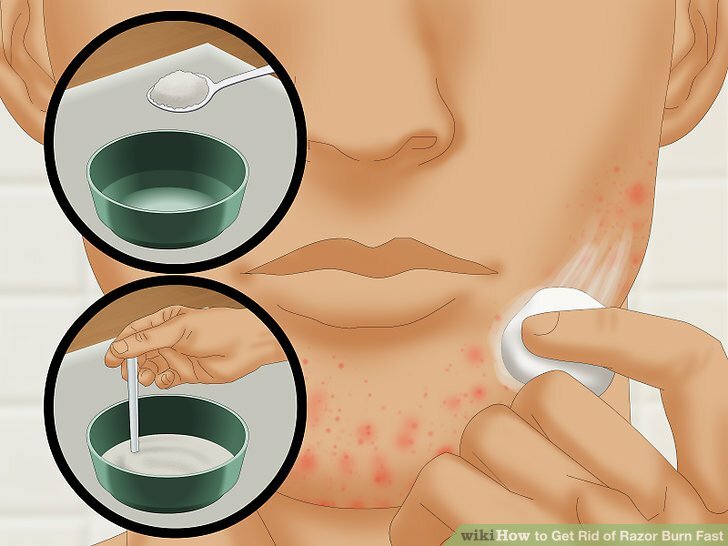 Apply the cotton ball to your razor burn two to three times each day, or as needed. Treat your razor burn with tea tree oil. 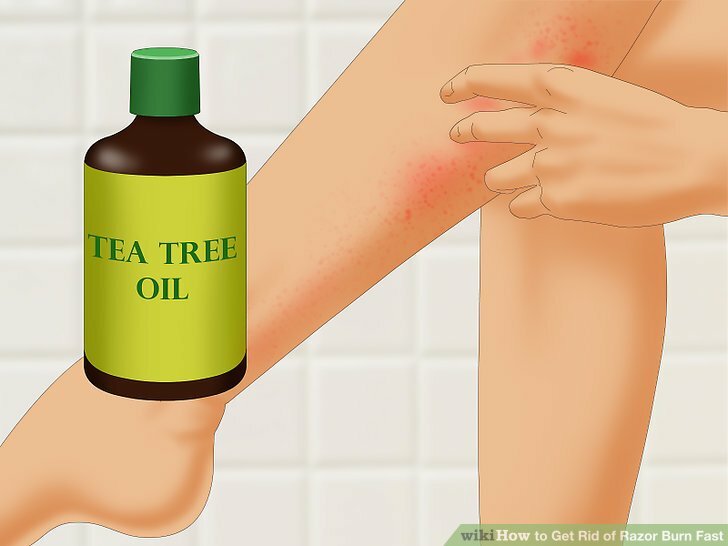 Tea tree oil contains antibacterial and antiseptic properties that can quickly relieve your razor burn. Mix three drops of tea tree oil with one tablespoon of olive oil or four to five drops of tea tree oil to two tablespoons of water. Massage the mixture gently into the affected area with the tips of your fingers and let it work on your skin for about ten to fifteen minutes. Wash the oil off with lukewarm water. Repeat twice a day or as needed. Use coconut oil to soothe your razor burn. Coconut oil contains lauric acid, a compound with healing, moisturizing, and antiseptic properties. 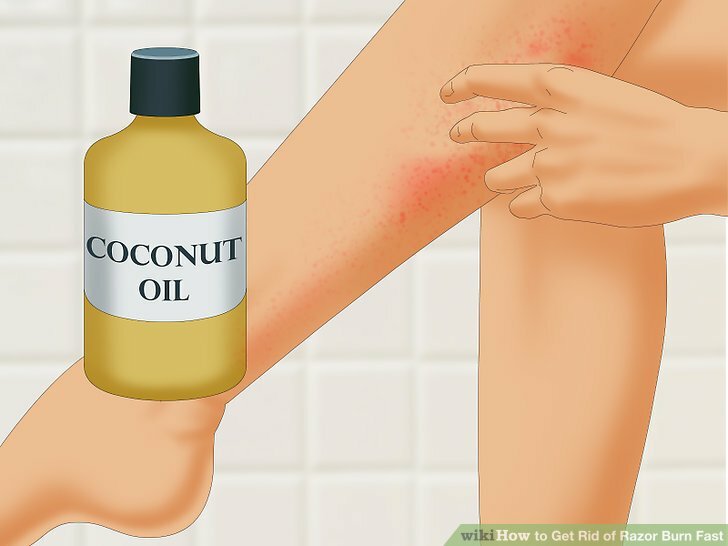 Pour a small amount of coconut oil on the razor-burned area and rub it over the skin. Do not apply a heavy layer. Repeat two to four times each day, or as needed. Aftershave is a product specifically designed to care for skin after you’ve finished shaving. There are two kinds of aftershave: aftershave splash and aftershave balm. Aftershave splash is a scented, alcohol based astringent. Aftershave balm is a hydrating lotion with a more mild scent. Experiment with a variety of aftershave brands and products to find one that soothes your razor burn. Aftershaves with vitamin E, provitamin B5, and chamomile are especially good for razor burn. Shea butter and birch wood are also ingredients you should look for in an aftershave product that is effective against razor burn. There are a variety of moisturizing lotions that can effectively get rid of razor burn fast. The best lotions for razor burn will contain glycolic acid, which encourages healing in razor-burned skin. Lotions containing alcohol, salicylic acid, or both are also useful, but could dry out your skin. If you have sensitive skin, check the ingredients label on your lotion to ensure it contains glycolic acid instead. Petroleum jelly can relieve irritation caused by razor burn, and keeps moisture on the skin. Rub a thin layer of petroleum jelly across the razor-burned area. Your skin will absorb it, so you don’t need to wipe or rinse it off. After about two hours, apply another layer. Continue until your razor burn has subsided. The anti-inflammatory properties of aspirin work wonders on your skin. Take two or three aspirin tablets and crush them in a small bowl. To crush them, you could use the flat bottom of a cup or a wide spoon. Add a few drops of water to the bowl and mix the contents with a fork to make a creamy paste. Four to five drops of water is usually sufficient, but add more if necessary. Rub the paste on the bumps and wait ten minutes. Rinse with lukewarm water. Apply this treatment twice per day until the bumps heal. If you are pregnant, allergic to aspirin, have a bleeding disorder such as hemophilia, or have a history of intestinal bleeding, do not use aspirin. Additionally, do not use aspirin while nursing or taking blood thinners. Apply an itch-relief cream containing hydrocortisone. Hydrocortisone is a topical medication that reduces itching, swelling, and redness of irritated skin. It can help calm itchy areas and speed up healing time. Don’t apply hydrocortisone cream for more than three days at a time. Avoid applying it to open cuts. Shaving too often will not allow your skin the time it needs to heal sufficiently from previous shaving sessions. Try not to shave more than once every four to five days. Razors should be disposed of after five to seven shaves. 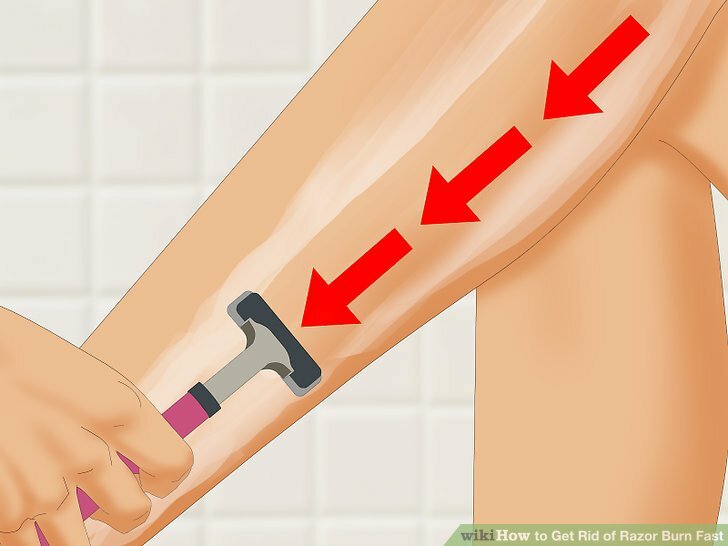 This way, you’re always using a sharp blade, and less likely to irritate the skin. Wet your skin with mild soap and warm water before shaving, then apply shaving cream or shaving gel. Shaving cream helps you get a smoother shave and reduces the likelihood of getting razor burn. Shave in short strokes. Don’t apply excess pressure; the weight of the razor should be enough to help you shave with the proper pressure. Always move the blade in the direction the hair is growing. If you pull the razor in the direction the hair is not growing, you might end up pushing hair into your follicles. Try not cover the razor-burned skin. 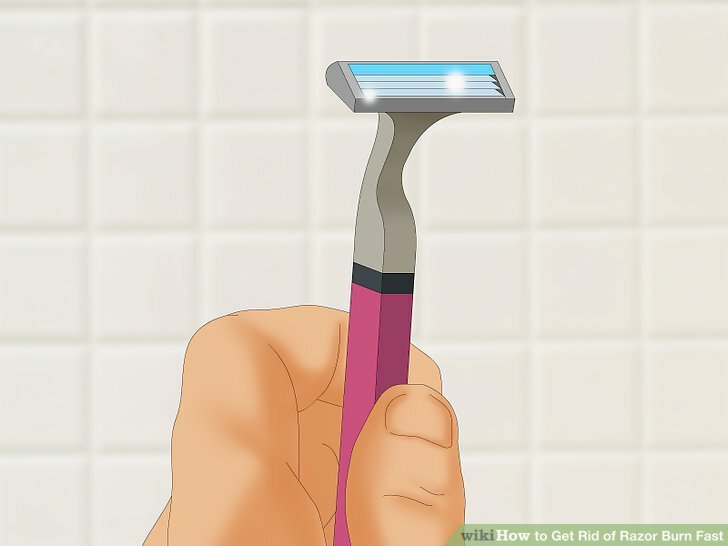 Allowing your razor burn to be exposed to fresh air can help you get rid of it more quickly. If you must cover the razor burn, wear only loose-fitting clothes to allow your pores to breathe. Wear cotton clothes. Synthetic clothes can irritate razor-burned skin. Wool, similarly, can exacerbate your razor burn. Cotton, on the other hand, is a more breathable material and will accelerate the razor burn healing process.